This battery is responsible for supplying energy to all your systems. 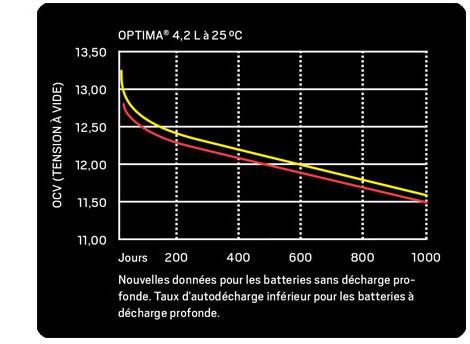 Its vibration resistance is up to 15 times higher than that of its competitors.The OPTIMA YELLOWTOP battery lasts up to three times longer than conventional batteries and guarantees constant power for the duration of the discharge cycle. Its energy is more constant, with a higher output voltage than conventional batteries. Its compact design reduces weight and makes it easy to fit in tight spaces. It is fully waterproof, does not leak, is highly resistant to extreme temperatures and can withstand storage for long periods. To top it off, it requires absolutely no maintenance. Deep discharge and starting power gathered in a single battery. Lasts up to three times longer than conventional flat-plate batteries. Consistent quality of performance: Your battery provides the same level of energy throughout the discharge. 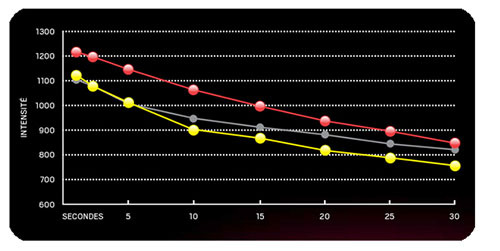 More power during the first second of starting (as well as during the first 3, 5 and 10 seconds of start-up), compared to conventional lead-acid batteries of the same category. Ideal for seasonal use: Once fully charged, the battery can remain unused for 12 months at room temperature (or lower temperatures) and will still be able to start a vehicle. Fifteen times more vibration-resistant than traditional lead-acid batteries. Can be mounted in almost any position. Once installed, you forget it. 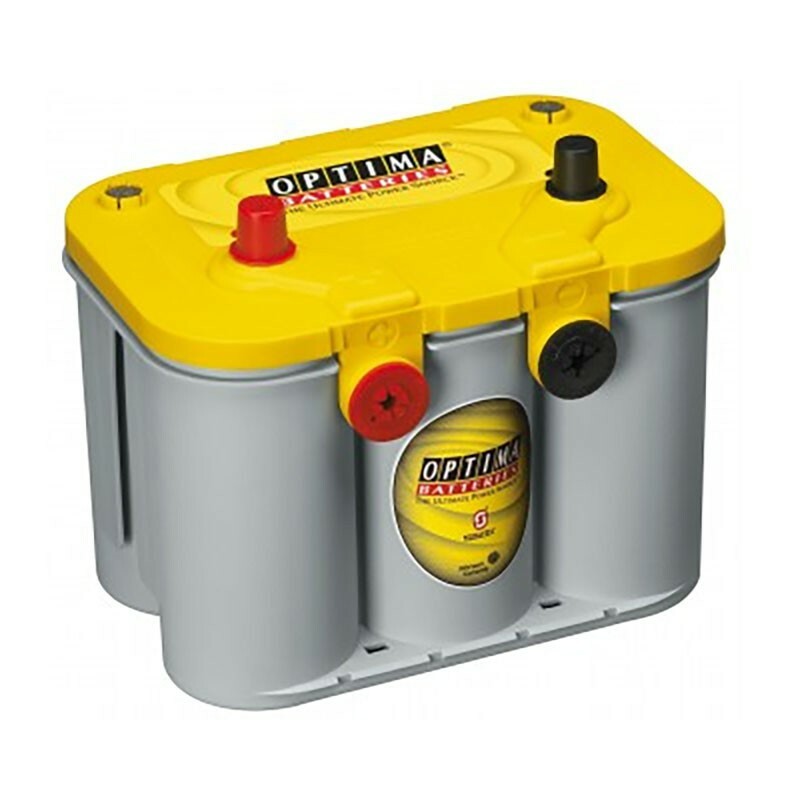 Whatever the conditions - humidity, heat, dust, exposure to extreme vibrations or normal discharge - the OPTIMA Yello wTop battery continues to provide power throughout the discharge cycle. Its ability to maintain a high voltage during the discharge cycle makes it possible to use a larger portion of the stored current than with traditional batteries. 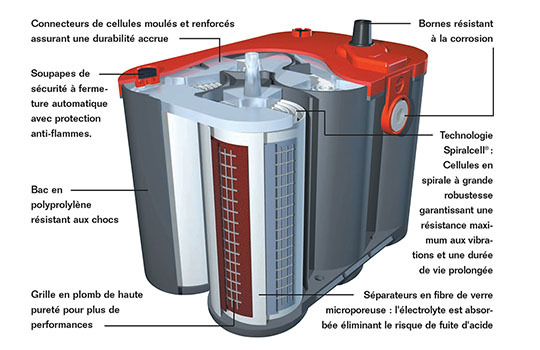 All thanks to OPTIMA Spiralcell ® technology, which combines the advantages of the starter battery with those of the deep cycle battery. The Yello wTop battery performs a large number of discharge and charge cycles without significant loss of capacity and its very low self-discharge rate makes it an optimal battery for seasonal use.